Programmes For Bodh, classrooms and community settings have always been seen as key sites for organisational learning. This direct engagement has helped Bodh in understanding the issues and concerns of deprived urban and rural communities and also, the potential for change. These aspects have shaped programme conceptualisation and implementation. Also, each programme has provided vital direction for future endeavours. At a basic level, the programmes aim at ensuring deprived children access to equitable, quality education. Other focus areas are universalisation of elementary education, school development and co-governance in school management processes. 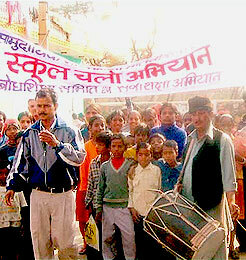 Currently, urban interventions are being implemented in Jaipur and Alwar cities, Rajasthan, India. 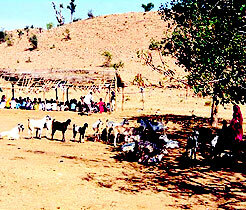 The rural programmes are being implemented in two blocks in Alwar. 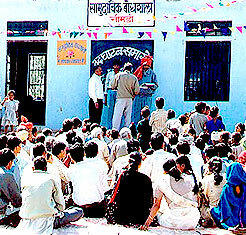 Bodh is involved several partnership programmes with reputed organisations across the country. These programmes reflect Bodh’s interest in utilising its experiences and working with likeminded partners for scaling up/replication in varied contexts. The partners also bring their own unique strengths and understanding, thus making it a collaborative, learning exercise. Bodh’s Central Research and Resource Centre is co-ordinating these programmes. The key partners involved are given below.